OKLAHOMA CITY (AP) – Oklahoma’s new Republican Gov. 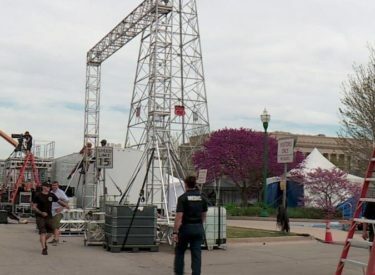 Kevin Stitt is taking a shot at the “American Ninja Warrior” obstacle course outside the state Capitol in Oklahoma City. Filming for the show will continue Friday and Saturday night for the NBC program’s 11th season. Other stops this season include Los Angeles, Atlanta, Oklahoma City, Baltimore, Cincinnati and Seattle.